People often ask me how to make kombucha. This kombucha recipe is one of the easiest fermentations you can make. The ingredients cost very little (tea, sugar and water) and the preparation is remarkably simple. The only minor complicating factor is getting your hands on a starting culture. The culture is often called a “mother” or a “mushroom” but don’t be fooled, it is not an actual mushroom, but simply a colony of bacteria and yeast. It is often referred to by the acronym SCOBY which stands for Symbiotic Culture of Bacteria and Yeast. The SCOBY floats on the surface of the Kombucha and every time you make a new batch of Kombucha, the SCOBY continues to grow and thus creates layer upon layer which can then be shared with someone else. If you don’t have access to a SCOBY from a friend, you can find one here. I can also show you how to make your own kombucha SCOBY. Make the tea - Take half of the water, heat it to a simmer and add tea bags. Allow simmer for a few minutes and allow to cool some. Place tea in the container you will use for the fermentation. Pour into fermentation vessel (I generally use a 1 gallon Anchor Hocking Jar). Add the remaining water. Heating only half of the water simply allows for faster cooling by adding cooler water to the recently simmered tea. For larger batches, you can use a 2 gallon Anchor Hocking Jar, but use whatever you like. Add the sugar - Add in 1 cup of sugar per gallon of tea. Mix well a couple of times over a few minutes until well dissolved. Make sure water is cool or at least not hot to the touch. Wait as long as necessary. Cover with a cloth to allow it to breathe some while keeping contaminants out. Let it sit for 10 days to 2 weeks - The longer it sits, the more tart the taste will become. Your taste is the best judge as to when it is ready. I've sometimes left mine for up to three weeks. What you are looking for is something just slightly sweet and a little tart. Warmer temps speed up the fermentation process. Bottle it - I like to adding flavorings such as juices and berries. My staple is adding some sliced ginger and 1/4 teaspoon of ground turmeric. These flip top bottles are great and attractive. Leave on the counter for a few days and then refrigerate* - This is a secondary fermentation period which helps to trap carbonation in the bottle and generate more carbonation. If you really want to make your kombucha fizzy, read this post. It's pretty amazing how much carbonation you can get our of your kombucha. Getting it to be nice and fizzy is something that can be inconsistent. 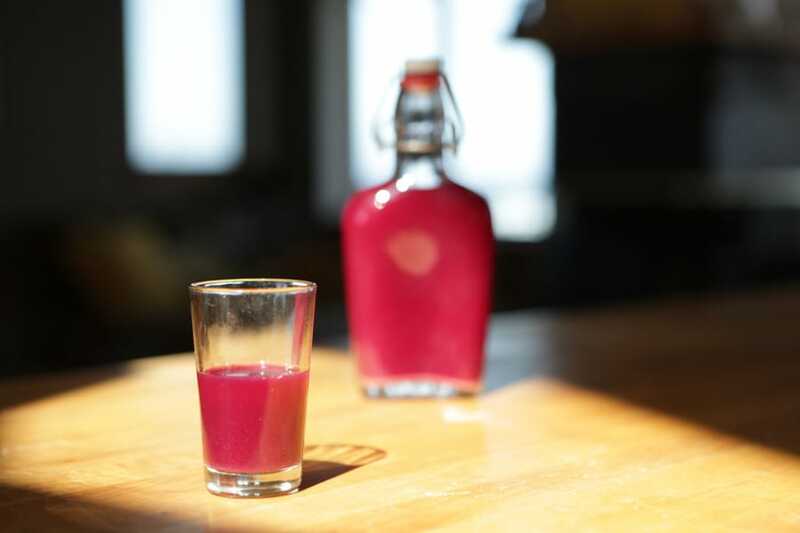 A carbonated kombucha drink is mostly a product of a healthy happy SCOBY with a stronger yeast component. If you want a fairly foolproof method for making your kombucha fizzy, check out Making Your Kombucha Fizzy with Ginger. Have some patience and trust during the fermentation and after a week, dip in a spoon in and give it a taste. Leave it longer if it’s not quite right. If for some reason you let your kombucha go too long and it gets too tart, there is no need to toss it. It is simply turning to vinegar. Split your SCOBY in half and leave one SCOBY with the old batch. After another month or so, you’ll have a nice vinegar with which you can make a health promoting Kombucha Vinegar Flu Tonic! Use the other SCOBY and start a new batch and simply be careful not to let it go so long next time! I target a pH range of about 2.9 to 3.15 for kombucha. You can measure with this pH Tester|http://amzn.to/2m6WsLL] which I use or get these [disposable pH Test Strips|http://amzn.to/2s2ga1I]. If you’d like to learn more about pH and Kombucha, refer to my more in depth article: pH level for Kombucha – What is the correct level? You say to use a spoon to test your kombucha, but I’ve heard that it’s best to avoid all contact with metal since it can react with fermenting kombucha and give it off-flavors. Have you had any problems with that or do you have any opinion on the matter? I haven’t noticed any problems with that and can’t honestly imagine that using a metal spoon would cause a problem. Your question reminded me of an episode on an old 60s/70s tv sitcom where butler played by Sebastian Cabot instructed the young girl that one must not cut the lettuce for a salad but gently tear it so it doesn’t turn brown. She then asked something along the lines of, “Then why do you put it in a metal bowl?” Good question. Actually there’s a valid reason for the “don’t cut lettuce” rule, one I only recently learned after 45 years of salad-making. When you tear lettuce, it mostly breaks along the boundaries between cells, which are like tiny perforations. This makes for a fresher tasting salad. When you cut it, you are cutting across the cell membranes, which makes for limper leafy greens. I tried this with bottled Kombucha years ago and it took a lot longer than a full fledged SCOBY. Maybe because the Bacteria and yeast are dispersed in the bottle, then it had to form a home (SCOBY) and there is the possibility that there was too much liquid for the amount of SCOBY material in the bottle. But it did work! I’m new to fermentation and am anxious to get started. My question is,does the liquid need to be strained after fermenting,prior to bottling? In my experience, there is no need to strain the kombucha before bottling. I believe some of the strainable material in the kombucha are yeast strands. When I first started making kombucha seceral years ago, I would strain it before bottling/drinking, but I soon gave up on that. I guess it’s more of an aesthetic issue than anything else, but certainly not necessary. can I use the scoby from the unfiltered apple cider vinegar with mother for my tea starter? I honestly don’t know a firsthand answer to your question since I’ve never tried it myself. My understanding is that the kombucha mother contains Gluconacetobacter xylinus while the Apple Cider Mother of Vinegar (MOV) does not. Not to say that you might not enjoy the results, but I don’t think the sweet tea base for the kombucha will respond the same way to using the MOV. Would love to hear what happens if you try it. Please let us know. I agree with ferment Ted. 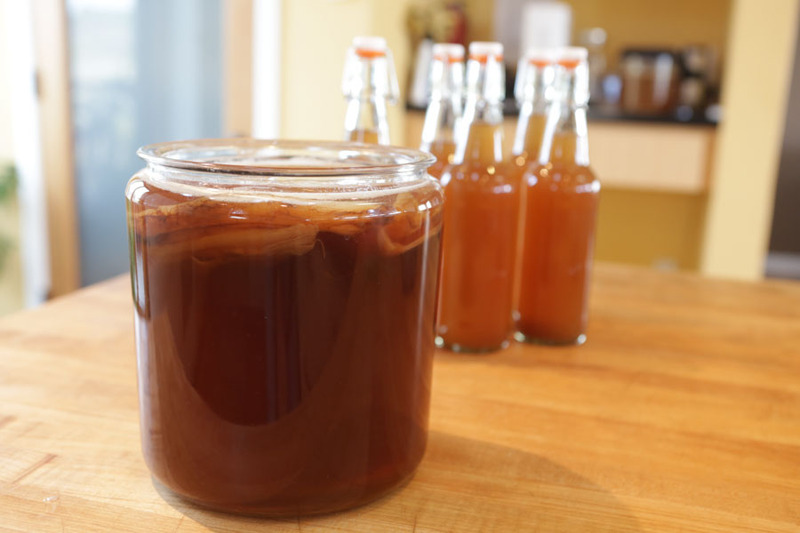 If you don’t have a scoby for Kombucha, use a bottle of Kombucha from a store, plain if possible. I make both kombucha and apple cider vinegar and have yet to try using my vinegar mother for kombucha. I have used a bottle of kombucha to start and it takes a while longer but it does work. On a side note, I recently used a wild blueberry powder in the second fermentation and man was that good, fizzy and pretty as can be. Too busy drinking it, to take a picture. The bubbles come after you move the Kombucha out of the 1st vessel and into smaller vessels. I ferment mine in a large pickle jar then pour into smaller glass jars (mason jars, some use ceramic cork/ wire stopper bottles). This is the 2nd fermentation stage, or 2f, the flavoful, fizzy, fun part! Add ONE raisin to each small container, then any flavor:grated ginger,chopped stone fruit, berries, melon, mango, pineapple, hibiscus, herbs, dried fruit, fruit syrup, fruit jam, spices, citrus…or any combo that strikes your fancy. Close and set on the counter again, 1-2 days. Pop the tops carefully several times a day to release fermentation and to avoid an explosion :)Refrigerate and enjoy. Thanks Steve for following up with your success in creating your own SCOBY. Couldn’t be easie. Enjoy and thanks for posting. can I ferment kombucha and water kefir in the same room? I wouldn’t worry about fermenting kombucha and kefir in the same room. I have often had a half dozen or more different ferments in the same room going with no problems. Keep them both appropriately covered. Question. Has anyone ever used raw honey in place of sugar? white sugar is NOT healthy at all. also what are the health benefits of kombucha? I haven’t tried honey in place of sugar. As to health consequences of using white sugar, my feeling is that almost all of the sugar is consumed during the fermentation process so you’re not diretly ingesting the sugar. I preferred to use raw sugars and organic where possible, simply to avoid overprocessing and pesticides. oh yeah,about metal use with kombucha, i was told that it was great at absorbing metals out of your body, and one didn’t want it to do this from metal strainers or spoons, then drink the metal traces. just in case,i always try to drink it so as to keep it off the metal fillings in my molars! yes kombi does absorb metal very quickly and I too would not let it soak up metal fillings too much on a regular basis…I wanted to dehydrate some for storage and in some absent minded way put them on a metal rack until an hour later when I said: “Oh shoot what did I do!? was supposed to use unbleached parchment paper!” By then the scoby (s) were very blackened wherever they made contact with the metal…put them in the composter…may not have been the best place in retrospect. Hello all, I’m new to Kombucha. My original scoby has been reproducing like mad. All is healthy and fine. Except I’m not getting an fermentation, none. Any suggestions for how I can get more than scobies and sweet tea would be greatly appreciated. I added my SCOBY to my new batch of tea mixture and after a couple days it sank to the bottom. It’s really thick. Is this a normal thing to happen? This happens occasionally. I have found that the healthier the SCOBY, the less likely it is to sink. Sinking isn’t the end of the world as it often rises again of it’s own accord or a new SCOBY begins to form on the surface. I haven’t studied this specifically, but my hunch is that the SCOBYs float because they’ve accumulated gasses, and perhaps they are likely to accumulate more gasses when the yeasts are more abundant. If a SCOBY sits for too long without being used, I find it is also more likely to sink than float. Good luck!